For this I advise you to use a proper pointy tagine dish but a heavy pan with lid will do if you can not have the real thing. The pointy shape of the dish does concentrate flavours wonderfully and makes a great centrepiece on the dinner table. 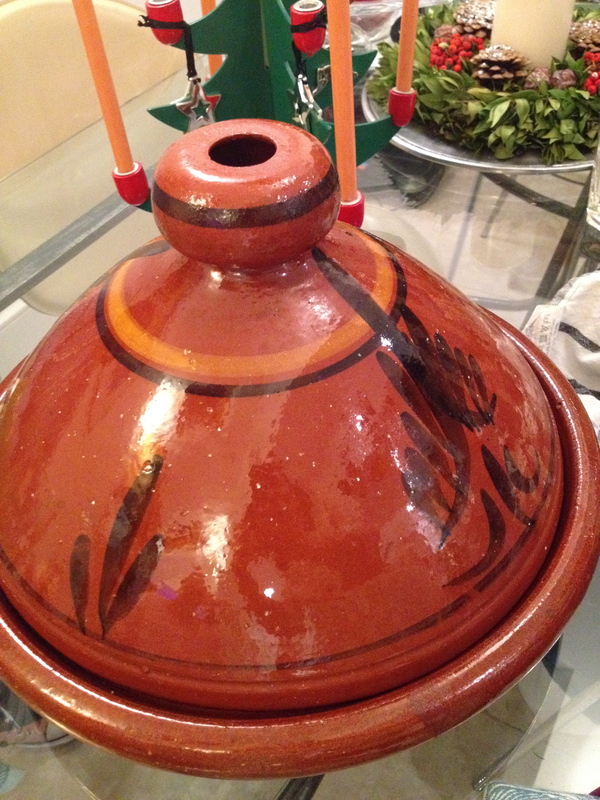 Do not forget to soak the unglazed underside of the tagine prior to using it to avoid cracking in the feat. I use a heat diffuseur as well over the hob. 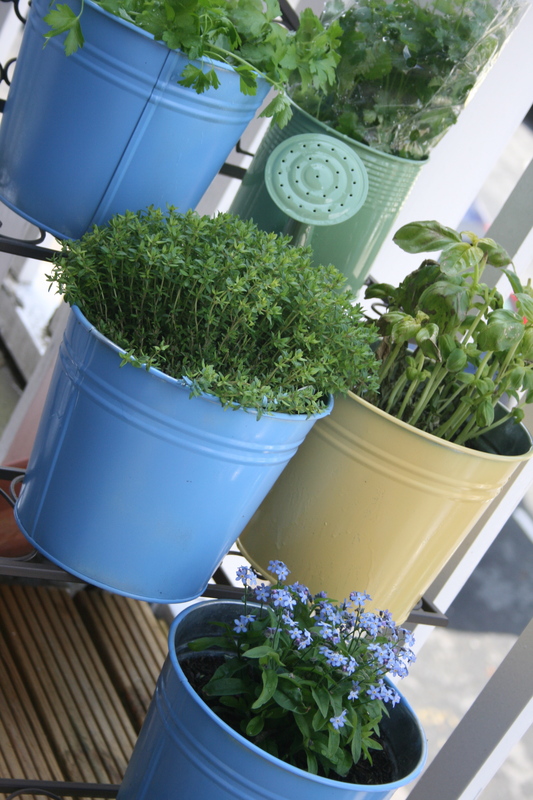 Parsley and coriander to serve. Fry the chicken in a pan with a little olive oil and turn each morsel a few times for about 15 minutes. Toss the M’rouzia mix over and roll the chicken in the spices until coated, add some salt, then reserve. Lay the sliced onion at the bottom of the dish, place the chicken bits over. Cut up the celery heart and the carrots lengthwise and pile on. Drain the chicken juice from the frying pan into a jug, add the passata, some more spice mix (M’rouzia is a current favourite but Ras el Hanout is good too). Then blend in some pomegranate syrup or grape molasses – in sale from any good middle-eastern grocer. You should have about 250ml of liquid. Add a bit of water if you need too, then pour it all over the meat and vegetables. Cover and cook on low heat for 45 min to 1 hour. Add the prunes at the end and give a little more heat for 5 minutes. Check the liquid level: the juice must be thick and reduced but still there to give moisture to the dish. To serve, sprinkle with chopped parsley and coriander, a small amount of roasted almonds and 3 tbsp of fresh pomegranate seeds. 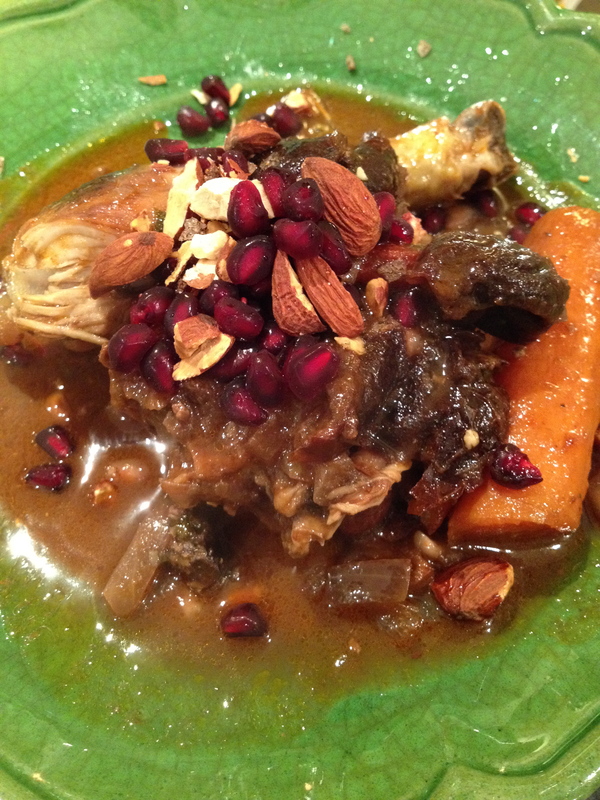 The mixed fruity and nutty flavours are great against the saltiness of the meat! You can serve it on it own or with steamed bulgur wheat. I love bulgur and it loves me back: it is impossible to fail and I really like its rough nuttiness better sometime than a silky couscous. The point of a tagine is melting meat and fragrant spices, slowly cooked in a traditionnally pointy dish with a lid so all the flavours remain as deep and intense as possible. Peel the quinces and cut them in quarters. Boil the quinces in the sugar with the cinnamon bark until the flesh is soft. Put aside. Chop the onions and brown them in a cooking pot with a bit of olive oil. Add the meat and the herbs, cover with the stock (or water with a stock cube) and cover. Put in the oven for 2 hours at 160˚. 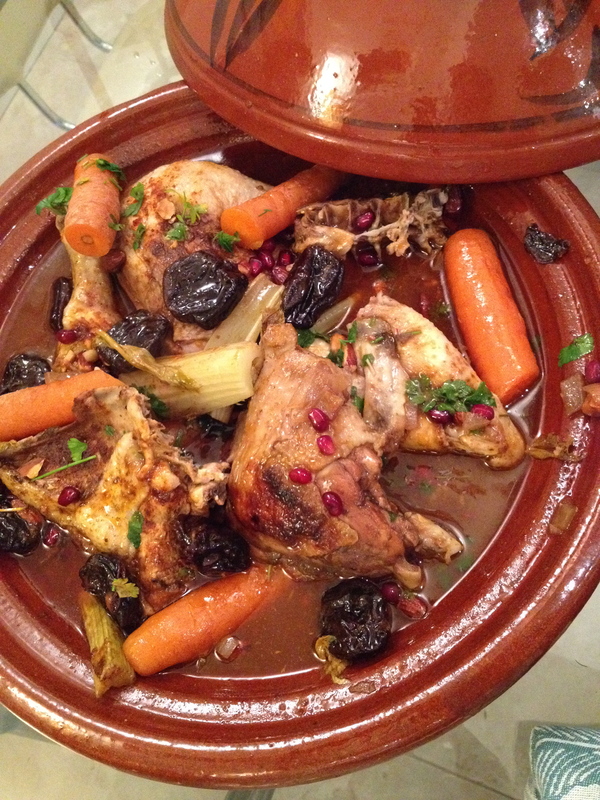 Tagines are one of the most fragrant dishes and spices need to be generously used there. Make sure you hit the right level – but not too high ! 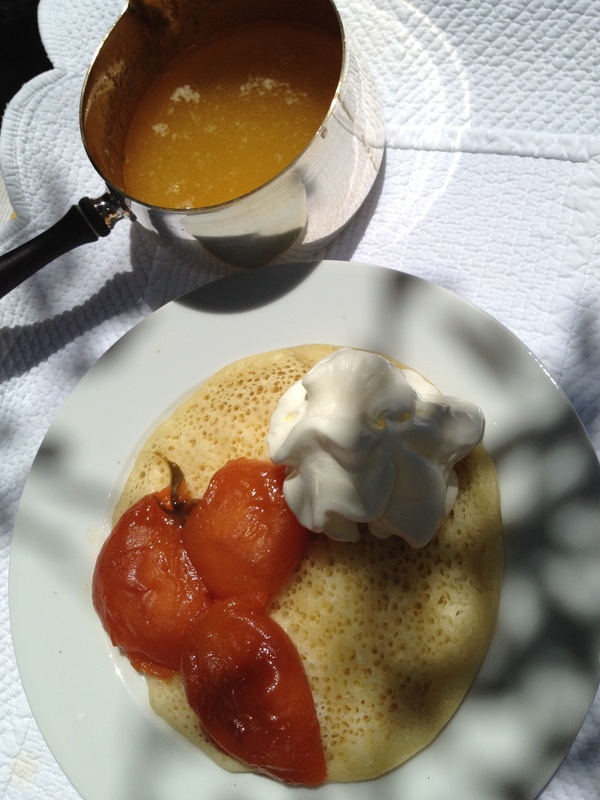 When the meat is ready, serve with the quinces and pour the warm syrup over the lamb and fruit. Sprinkle the chopped coriander and parsley before serving. 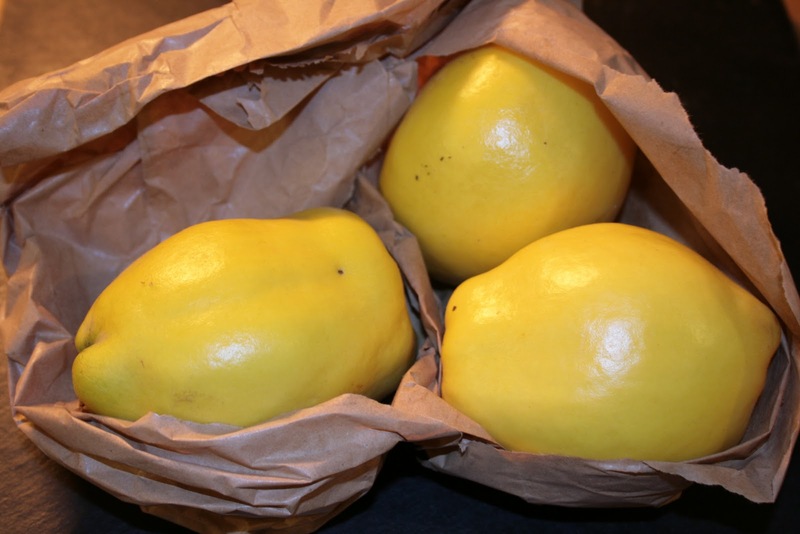 Beautiful golden quinces from the fruit market!